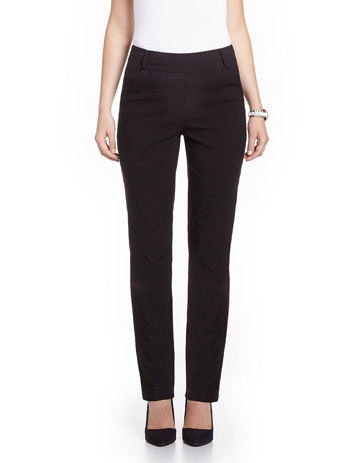 Spruce up your looks with our Iconic straight leg pants and their 2-tone jacquard pattern. Featuring a comfortable waistband with belt loops, two front pockets and two back mock welt pockets, they're both elegant and feminine. Pair them with flats and a light sweater for on-trend style. Front rise: 9 5/8" ; Inseam: 31 1/2" ; Leg opening: 7"
Too tight but evidently will stretch with wear. Returned. Skin tight. Not age appropriate for me. Size up was baggy in the crotch area. Did not look good. Nice colour, nice textured pattern. Very stretchy. Very comfortable and a great fit, love them!! Runs small. I don't like skin tight pants. The online tip said to buy these pants a size down to make them fit smoothly. Ordered current size and they were tight. Will return for larger size in store if they have it. Fit, fabric and comfort all perfect. Can't yet comment on washing.